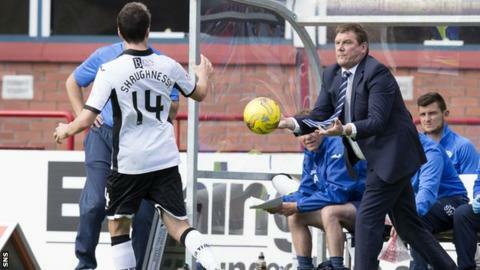 Tommy Wright hopes he is witnessing a typical slow St Johnstone start to the season after a third straight Premiership game without a win. Saints have two points from their opening four games after a 2-1 defeat away to Dundee. "We went through a spell last season like this, so I'm hoping it's a St Johnstone thing and we're notoriously slow starters," said manager Wright. "But there's enough to give me confidence going forward." Wright thought his side were unfortunate not to claim a point after trailing 2-0. "We've had a goal chopped off and there's a clear penalty on Brian Easton near the end where everybody in the ground can see his shirt's pulled," he told BBC Scotland. Goals from James McPake and Kane Hemmings put Dundee in control until Steven MacLean's reply. "Again, we put ourselves behind the eight ball," said Wright, who thought his side started the game well until conceding the goals. "You are 2-0 down with playing reasonably well after giving away two stupid goals and you can't do that at this level. "We've put ourselves in poor positions chasing games in every game this season and, for all our good play, I think we've done more than enough to get something out of the game. "It is individual errors that's causing it and we really must eradicate that." Dundee boss Paul Hartley praised defender McPake, who also scored in midweek against Dundee United. "He's a former striker, but it's a brilliant finish with his left foot - just instinct - and Hemmings gets a second goal from great play from Nicky Low," he said. "I always felt we needed that third goal. We passed up great chances and especially in the second half. "St Johnstone get back into the game at 2-1 and have a spell of getting a lot of crosses into the box, but we dealt well with it. "We changed our system a wee bit to cope with their aerial threat." Hartley was reasonably happy to gather seven points from their opening four fixtures. "I think it has been solid," he said. "We feel we should have more points, but I'm pleased with what we've got so far."